Producer Boi1da shared the news on Tuesday. It looks like Drake's record-breaking year isn't over yet — the OVO mogul's Scorpion mega-hit "God's Plan" is now reportedly certified diamond. One of the track's producers, and OVO in-house beatsmith, Boi1da pointed out the news on Tuesday, posting to Instagram and writing, "We did that! God just keeps on blessing us. Thankful for everyone involved in this masterpiece full circle. @champagnepapi I don’t know how you do it but you never fail, salute!!" After being released in January, "God's Plan" spent a monstrous 11-weeks atop the Billboard Hot 100 charts, helping Drake break the record for the most weeks at #1 in a year. 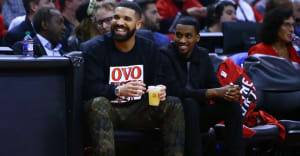 In addition, Drake has shattered multiple streaming records with his fifth studio album Scorpion, including the record for most Apple Music streams in a day with 170 million streams. Thumbnail image courtesy of David Becker/Getty Images.